For people on a diet hunger is one of the biggest issues that many of them struggle with, this is why these top 10 foods to fill you up are so important. By learning what types of foods can help you feel full longer, you can devise a diet plan that can help you to fight hunger. Dieting isn’t about starving yourself to lose weight. It’s about learning to eat right, and learning how to satisfy your hunger without indulging in high calorie, unhealthy foods. By learning about these top 10 foods that fill you up, you can satisfy your hunger while still working toward your weight loss goals. 10. Chicken breast. 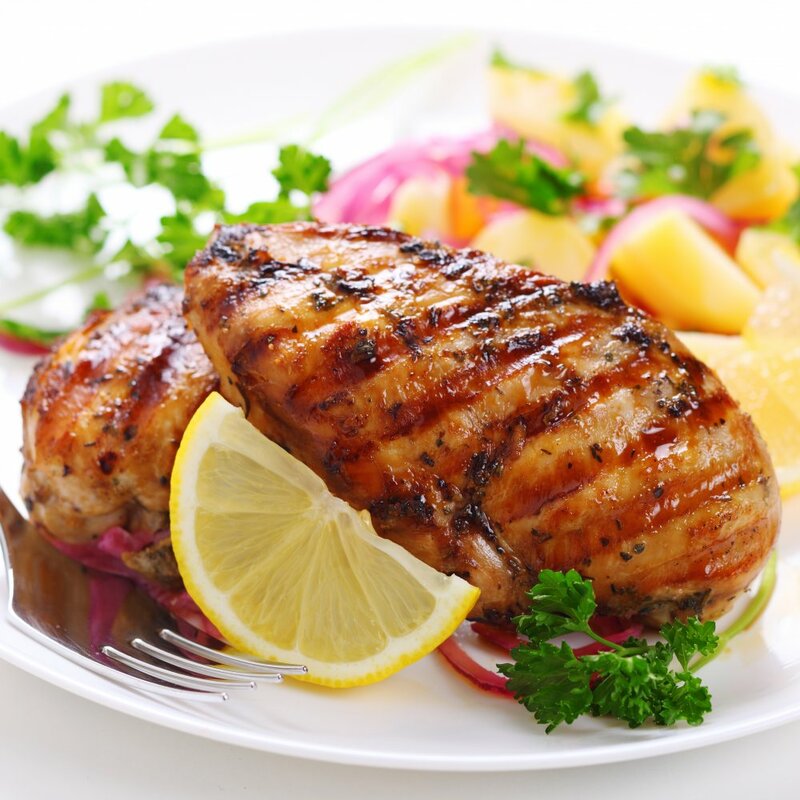 Chicken breast is a food that is very high in protein and low in carbohydrates and fat. Protein is not only great for you if you are dieting, it is also a food source that keeps you feeling full longer. It’s important to remember that when eating chicken breast as part of a weight loss program that you only eat it when it’s prepared in a healthy way. This means you can eat it grilled and baked, but not fried. 9. Lean beef. Most people don’t realize that beef can be a healthy source of lean protein. When it comes to learning about the top 10 foods to fill you up then you need to throw out preconceptions. As long as the beef you are eating is lean, and it is properly prepared, then you can eat it and still lose weight. 8. Baked Potatoes. For years potatoes have had a bad reputation as a food that is bad to eat, especially when dieting. However the truth is that baked potatoes are a great source of fiber and vitamins, and even though they are full of carbohydrates this isn’t necessarily a bad thing. You need carbohydrates for energy, and because baked potatoes are very filling they can be a part of your diet plan. 7. Beans. Beans are another food that are high in fiber, but in addition to fiber they are also high in protein. Eating bean soup, or as a side dish is a great way to fuel your body and curb your hunger. Just remember that the way that beans are prepared is very important. You should eat beans that are boiled, and make sure that you avoid refried beans. 6. Eggs. Eggs are a great source of protein, and have the added benefit of being a very versatile food. You can scramble them, poach them, or even fry them. If you want to make a meal of them you can make an omelette out of eggs and add your favorite healthy foods to the mix. 5. Greek yogurt. Greek yogurt is a variety of yogurt that has gained a lot of popularity recently as a health food. The reason for this is simple, it’s loaded with protein, is low in calories, and is very low in fat and carbohydrates. Adding a few cups of Greek yogurt a day to your diet will keep you feeling full while also giving your protein intake a big boost. 4. Apples. Along with protein, foods that are high in fiber are also great at keeping your hunger at bay. Apples are very high in fiber, and they are also full of a lot of essential vitamins and minerals. If you feel the need to add some more protein to them then feel free to add peanut butter to your apple slices. 3. Oatmeal. Oatmeal is another of the top 10 foods to fill you up that many people might be inclined to avoid. Oatmeal if full of carbohydrates, but they are the good kind. The slow digesting carbohydrates in a bowl of oatmeal can keep you full for a long time, and also give you a great energy boost that lasts. If you want to feel full after breakfast there aren’t many options better than a bowl of oatmeal. 2. Peanuts or almonds. Snacking is something that most people do throughout the day. By eating peanuts, almonds, or another type of nut you can get a high protein snack that can help you to feel full and satisfied for a long time. 1. Avocados. Yet another of the top 10 foods to fill you up that many people tend to avoid. Avocados are full of healthy fats and proteins, and can be a great addition to any diet.